Friends have been urging me to do some fresh electronic design. So, a fortnight ago, I fired up an oscilloscope for the first time in a year or two (one can "see" into circuits using an oscilloscope). Then I designed a novel four-component LRC oscillator, as the basis for a metal detector. Progress looks good -- but I have lost the "drive" to do this. 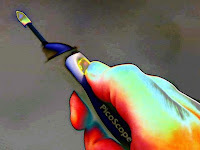 The photo shows the oscilloscope probe.